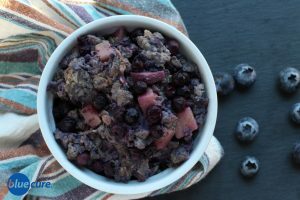 Blueberry- ginger apple bake is a great way to start the day; it’s an easy recipe that’s packed with wholesome ingredients. Whole grains, healthy fats, fruit, and spices. Make it ahead of time for a quick, grab and go breakfast or even serve it for dessert! Besides adding flavor to the dish, ginger may provide great health benefits; such as being anti-inflammatory and helping relieve chronic pain. Learn out more about ginger on our food page. If you are not a big fan of ginger, this dish has a very subtle ginger taste. For those that like the taste of ginger, feel free to add more to your liking. Preheat the oven to 350F. Wash and dice the apple into small pieces. Place the oats, diced apple, and blueberries into a baking dish. In a high-speed blender, combine the cinnamon, ginger powder, vanilla, cashew butter, flax, and water. Add 1-2 dates if you want the bake to be sweeter. 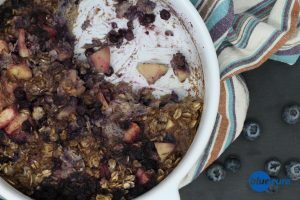 Blend until smooth and then pour over the oats and fruit. Stir the mixture. Bake for 40-45 minutes or until desired texture. Allow to cool for a few minutes, and then enjoy! *Optional to pour soy milk or homemade cashew milk over the bake. (To make a quick nut milk, blend 1 tablespoon of cashew with 1 cup water and pour over the dish).